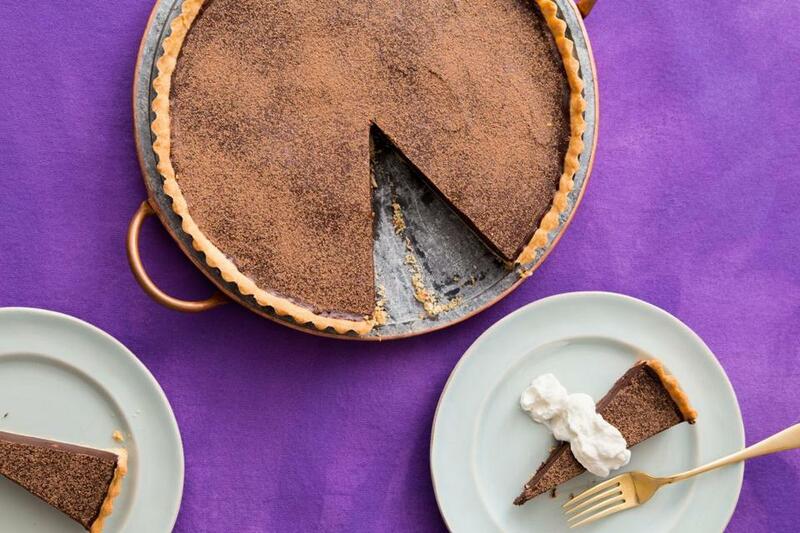 A chocolate tart perfect for your valentine. Valentine’s Day is the ideal occasion to bake your beloved a homespun yet elegant chocolate tart. As chocolate desserts go, this one is relatively restrained — a thin layer of lush, potent ganache contained within a just-sweet-enough, cookie-like crust. Delightfully simple, both to make and in appearance, it’s indulgent without being excessive. In short, a perfect way to say “I love you” in the language of chocolate. I developed these recipes using semisweet and bittersweet chocolate, with cacao content of 54 percent and 60 percent, respectively. With its compact, seriously rich filling, a little of this tart goes a long way, so serve small slices. Because the filling is a ganache, without eggs or other ingredients to stiffen it, it needs the full 3-hour resting time to set fully so it can be sliced neatly. Don’t cut that time short. The tart is attractive unadorned, but if you want to spiff it up a bit, here are three simple options: a light dusting of Dutch-process cocoa powder; a small pile of shaved chocolate or chocolate curls in the center or in a ring around the perimeter (or both); or a sizable dollop of whipped cream in the center. You’ll need a 10- or 11-inch tart pan with 1-inch sides and a removable bottom. In a small bowl, beat the egg yolk, cream, and vanilla extract and set aside. In a food processor, pulse the 1‚ cups flour, the sugar, and ¼ teaspoon salt to combine. Scatter the butter pieces over the flour mixture and pulse until butter and flour are thoroughly combined and have the texture of even, barely moist sand, about 7 2-second pulses. With the motor running, add the yolk-cream mixture all at once through the feed tube and process until the dough comes together in a mass, about 40 seconds (do not overprocess). Transfer the dough to a piece of plastic wrap, knead it once or twice until it is cohesive, pat it into a neat 5- or 6-inch disk, wrap, and refrigerate until very firm, at least 1 hour and up to 3 days. Rest the dough at room temperature for about 5 minutes. Lay a large piece of plastic wrap on your work surface, dust it with flour, place the dough in the center, dust the top of the dough with flour, and roll it into a circle about 14 inches in diameter and ¼-inch thick. Grasping the plastic wrap by an edge, gently flip the dough over a 10- or 11-inch tart pan with 1-inch sides and a removable bottom. Peel off and reserve the plastic wrap. Ease the dough into the corners of the pan, gently lifting it bit by bit as you work your way around the perimeter. Trim the edges of the dough, folding any excess into the pan and pressing into the fluted sides to thicken and reinforce the sides of the tart shell. Cover with the plastic wrap and place the dough-lined pan in the freezer for at least 30 minutes and up to 2 weeks. When ready to bake the crust, place an oven rack in the middle position and heat the oven to 375 degrees. Place the frozen, dough-lined pan on a baking sheet, line the dough with aluminum foil, and fill with pie weights (dried beans will work, too), making sure there are enough weights to reach partway up the sides of the pan. Bake for 25 minutes, rotating pan halfway through. Carefully remove foil and weights and continue baking until the crust is golden brown, about 10 to 13 minutes longer, rotating the pan halfway through. Keep a close eye on the crust to avoid overcooking the perimeter, and cover the edge with foil if it begins to darken too much. Set the tart pan on a wire rack to let the crust cool to room temperature. To make the filling, place the chocolate and butter in a heatproof bowl. In a heavy medium saucepan over medium-low heat or in a microwave-safe container in the microwave, heat the cream until hot and steamy but not simmering, stirring occasionally, about 10 minutes on the stove or 3 minutes in the microwave. Do not let the cream boil. Add the espresso powder and ¼ teaspoon salt and stir gently to dissolve. Pour the cream mixture over the chocolate and butter, cover the bowl, and set aside until the chocolate is softened and mostly melted, about 2 to 4 minutes. Add the vanilla and, with a heatproof flexible spatula, gently stir the mixture until it is smooth and uniform. Pour the mixture into the cooled crust and shimmy it gently from side to side to distribute the filling; pop any noticeable air bubbles on the surface with the tip of a toothpick and shimmy again to smooth the surface if necessary. Set the tart aside to rest until the chocolate filling firms up, at least 3 hours. Remove outer ring from tart pan, and, if desired, insert a long, thin, metal icing spatula between crust and pan bottom to loosen tart and gently slide it onto a serving platter. Cut it into small slices and serve, garnishing each slice with a small dollop of whipped cream if desired. Mexican chocolate is often flavored with cinnamon, almond, and a touch of chili. Here, a little cayenne provides a sneaky and engaging tingle in the finish, rather than overt heat. 1) Omit the espresso powder. 2) Before heating, add 3 tablespoons of dark brown sugar to the cream. Once the mixture is warm, stir gently to ensure that the sugar has dissolved. 3) In the chocolate mixture, decrease the vanilla to ½ teaspoon and along with it add ½ teaspoon almond extract, 1½ teaspoons ground cinnamon, and ¼ teaspoon cayenne, or more, to taste. Choose a Scotch with a smoky flavor for this recipe. Visually speaking, because you drizzle each serving with honey, I wouldn’t garnish this variation with cocoa powder. 2) Add 3 tablespoons Scotch to the chocolate mixture along with the vanilla. 3) At serving time, lightly drizzle each slice with honey to taste. 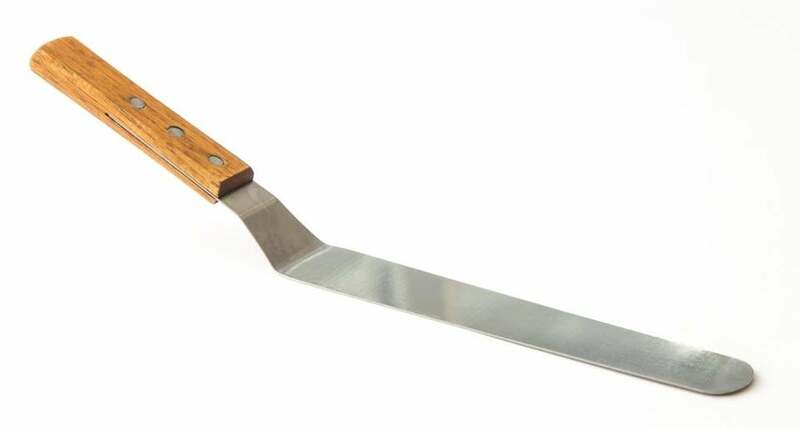 Though you can cut slices from the tart while it’s still on the pan bottom, if you choose to remove it, a long, straight icing spatula is a great tool for the job. Cautiously insert the thin metal blade between the crust and the pan bottom, continue shimmying to loosen the tart, and carefully slide it off the pan onto a serving plate or board.